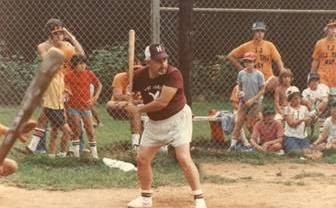 Herbie at bat during a Hill-IJ game on lower field. The Herb Cohen Memorial Fund was started in 2001 by Saginaw alums to honor the memory of Herbie Cohen. One of the goals of the Fund is to provide scholarships to camp for kids in need. Since 2001, the Fund has given out more than 200 scholarships for children to attend Camp Saginaw. In addition, the fund has awarded 10 scholarships to sponsor children to attend the Variety Club’s Camp for Children with Disabilities. The Variety Club was one of Herb’s favorite charities. To learn more about the Fund and how you can contribute to its success, please see the letters from Funds board members. Please consider making a donation to the Fund! Mark your calendars for the Saginaw 2014 reunion the weekend of September 19, 2014. To volunteer to be on the Reunion Committee, email Andrew Senker at andrew.senker@comcast.net. The Herb Cohen Memorial Fund is a 501(c)(3) registered charitable organization and all donations are tax deductible to the extent allowable by law.